This bookshelf-busting testament to music geeks' mania for lists is about as comprehensive a ""best-of"" as any sane person could want. Editor Dimery and the army of 90 music critics he drafted to compile this beast begin in the 1950s with Frank Sinatra, end in 2005 with The White Stripes and cover every genre, sub-genre, fad, flash-in-the-pan and musical movement that hit in the intervening years, taking each on their own merits. So, noise-and-terror group Lightning Bolt (featuring ""a 'singer' who barks through a contact microphone taped inside a gimp mask"") gets lauded as a ""truly challenging listening experience,"" Bon Jovi's ""Slippery When Wet"" gets dubious props for turning ""heavy metal into a pop genre that women would be able to love"" and Yoko Ono gets ignored. Arranged chronologically and with an excellent index, the book's a pleasure to peruse. Hundreds of jacket art reproductions accompany original track listings, and the critic-penned album summaries are brisk, informed, devoid of snark and full of argument-ending trivia. 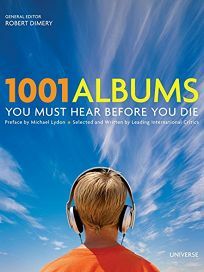 As with any list, there are bound to be glaring omissions and contentious inclusions, though Dimery buffets the book somewhat by disqualifying from consideration compilations, greatest hits albums and most soundtracks. For music lovers, it doesn't get much better.